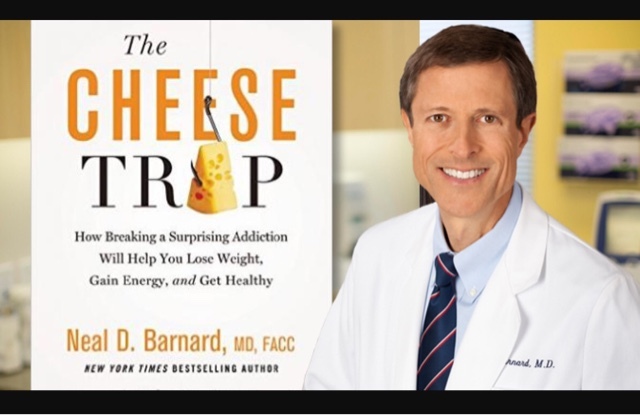 "Cheese—a high-fat, high-cholesterol, and high-sodium topping—is nearly everywhere, from K-12 school lunch rooms to elegant dinner parties. It even has its own aisle at the grocery store. Could steering clear from this product, one that’s a linchpin in the standard American diet, be the catalyst to weight loss, optimal health, and disease prevention?" 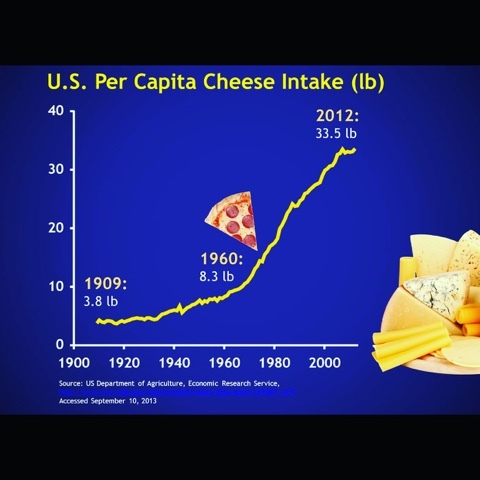 Personally, I cut cheese out of my daily nutrition 3 years ago and anytime I've tried to "splurge" I've not only gotten sick but develop weird cravings for foods I would never eat. 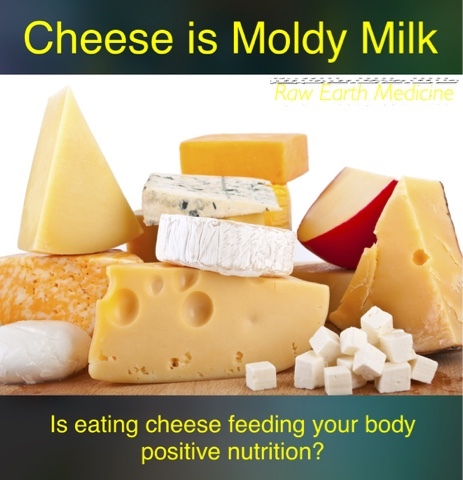 I think the combination of hormones, fat, lactose and mold in cheese is a deadly addictive combination. Bring water to a boil and add Turmeric Root. Boil for about 5 minutes and the water should turn orange. Add the Orange Zest and Coconut Sugar then let boil for another 5 minutes. Strain and drink hot or cold! Tip: I don't mind straining the tea but if it's a bother to you, you can use tea pouches, cheese cloth or an immersion ball and stuff them with the ingredients for a quick no hassle tea! 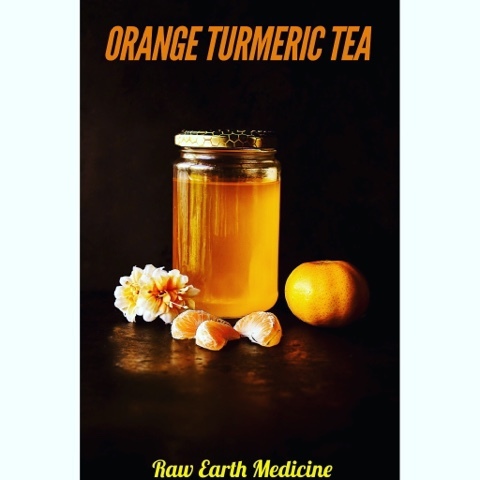 Health Benefits: This tea is a super concentrated anti inflammatory and your first line of defense against inflammatory diseases, like cancer. Adding this tea to your daily routine will do wonders for your joints, any pain issues you have and your immune system. Give yourself a natural boost of energy while your body benefits from this tea and it's delicious too! Mix all ingredients in your serving bowl. This will be the base salad for this dish. Place all ingredients in a bowl with a cover then place in the fridge to chill for a minimum of 15 minutes. Pulse all ingredients, except for the quinoa flour, in a food processor. Once all the ingredients are finely pulsed start adding 1 tbsp of Quinoa Flour at a time until the mixture forms a crumbly looking dough that will form into Patties. If the dough is too crumbly you keep adding flour until it isn't. You can always add more coconut oil as a binder but, I prefer to use as little as possible. Form into Patties and place in the fridge for a min of 20 minutes. You can absolutely eat this raw! Pan Fry: Add a thin layer of oil to your pan and heat until sizzling. Submerge patty in the oil and fry until crisp on each side. - the high fat from the oil and frying has turned a healthy Falafel Patty into a fatty splurge of a patty. 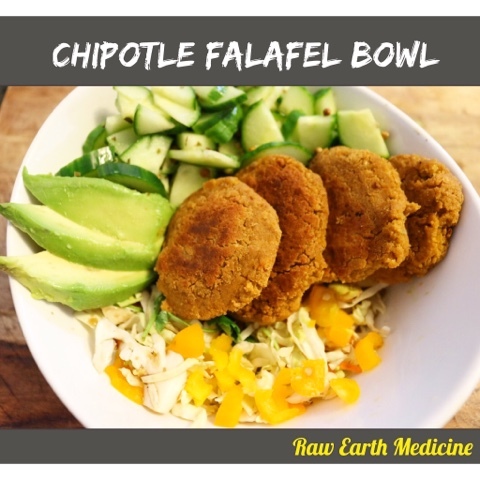 Layer your bowl with the cabbage salad then add the Pickled Cucumber, Falafel Patties and Garnish with Avocado. This dish can be prepared in the healthiest way to feed your body delicious nutrition or can be made in a decadent fatty way. By making small changes in how you prepare a meal, you can really make a huge impact on your weight, your immune system and your overall health. And create a lifestyle you can live with! Pineapple sprinkled with Cayenne Pepper for breakfast!? 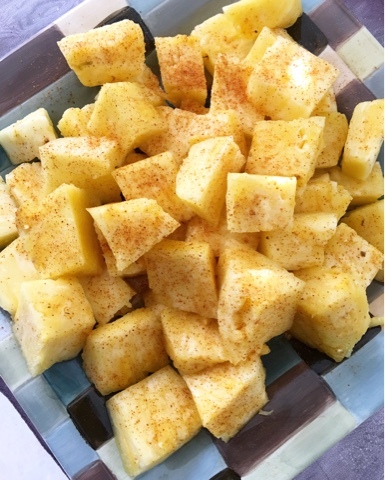 Mmmm Pineapple sprinkled with Cayenne Pepper for breakfast! Combining two powerful anti inflammatory foods together to create the equivalent of taking two Advil and a Celebrex! That's how you use food as your medicine so your body heals instead of masking the issues that cause the inflammation and creating work for the body by having to figure out what to do with the byproducts from the pills. Many studies have shown that bromelain, an enzyme found in pineapples, can reduce swelling, bruising, healing time, and pain associated with injury and surgical intervention. Bromelain is currently being used holistically to treat and reduce inflammation from tendinitis, sprains, strains, and other minor muscle injuries as well as swelling related to ear, nose, and throat surgeries or trauma. Cayenne Pepper is known as Capsicum in Holistic medicine. Capsicum increases metabolism by immediately influencing the venous structure. Its benefits on our bodies are nothing short of amazing, especially its effects on the circulatory system as it feeds the vital elements into the cell structure of capillaries, veins, arteries and helps adjust blood pressure to normal levels. Combining the powers of Bromelain and Capsicum daily, will do wonders for your body and can help you heal much faster with any type of injury or ailment. The best way to see results is to be consistent. Give it a try for at least 2 weeks and you'll be pleasantly surprised with the results! You will feel so much less pain and you will have so much more energy! Heat your frying pan with either a cooking spray or 1/4 cup of water and then add minced Garlic and Onions. 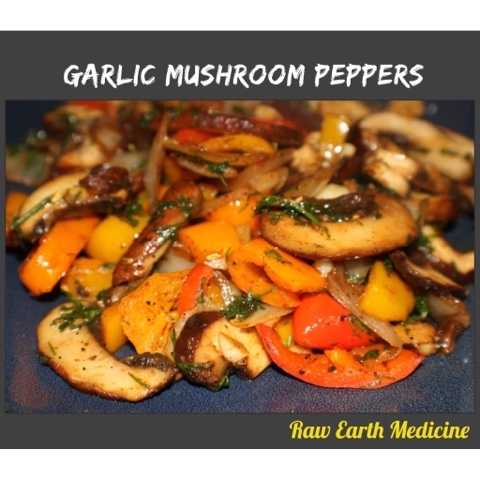 Once the Garlic starts to brown add the mushrooms and peppers. Stir until Mushrooms are soft then add Dill, Parsley and Fennel Seeds. Sauté for 2 more minutes and serve! This is an amazing side dish or can be used in many recipes like fajitas, pasta and rice dishes. Dress it up with curry spices for an Indian Style dish or add Basil with some Nutritional Yeast to make it an Italian dish or maybe a dash of coconut sugar and soy sauce for a Teriyaki taste. The possibilities are endless. Nutrition tip: By adding Fennel seeds to this dish it reduces the acid from the onions making it impossible to get heartburn or gas from this dish! 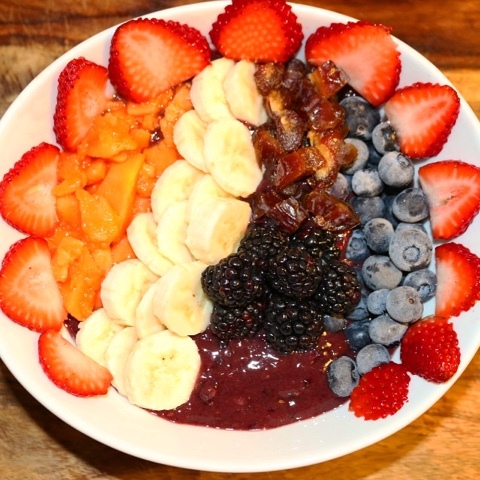 Blend all ingredients and top with strawberries, banana, dates, papaya, Blackberries and Blueberries. 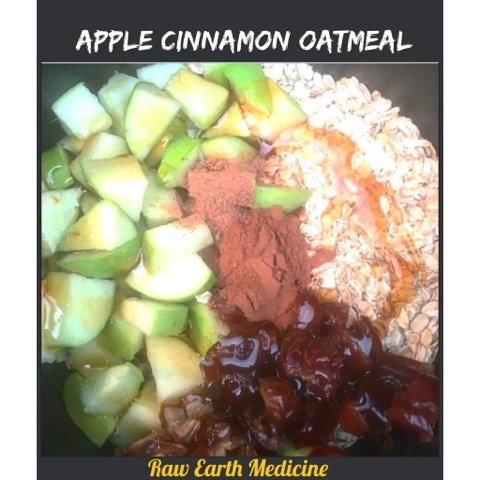 This recipe is a super defender against free radicals and other airborne illnesses. It contains an extremely high ORAC value. ORAC values are a measure of the antioxidant activity. It measures the degree and length of time it takes to inhibit the action of an oxidizing agent. Antioxidants inhibit oxidation which is known to have a damaging effect on tissues. Studies now suggest that consuming fruits and vegetables with a high ORAC value may slow down the aging process in both the body and brain. 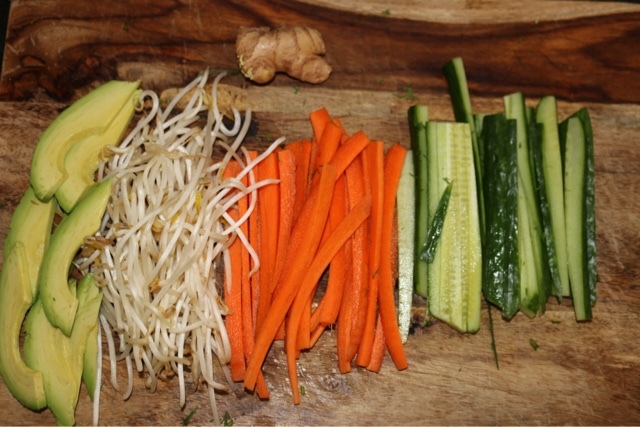 So nutritious, delicious and easy to make! Mix all ingredients in a bowl and chill in the fridge until serving. 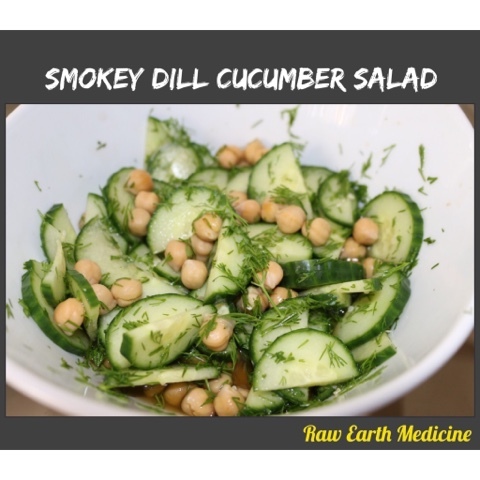 This simple twist on a Cucumber Salad is full of complex flavors and is very healthy! There is no fat in this salad and the dressing adds to the health benefits instead of destroying them like most salad dressings do. Simple ingredients, big flavor and so easy to make! Healthy can be delicious! Bring water to a boil then add Brown Rice and Coconut Sugar. Boil for 15 minutes then start stirring every few minutes. When the water starts to thicken (about 25 minutes into boiling) add the Ginger and Liquid Aminos. Keep stirring until the water is gone and the rice will have a creamy Brown coating on it. Lay the Nori Paper on a plate. 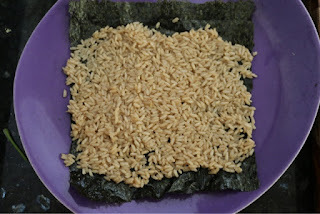 Make a thin layer of Ginger Rice leaving about a 1/2 an inch boarder on two sides. On one end layer Carrots, Cucumber, Avocado and Sprouts. Using the 1/2 inch boarder start to roll the Nori Paper tightly over the veggies. Keep rolling until it forms a log. You can use parchment paper or your hands to press on the roll to make sure it's all tightly rolled. 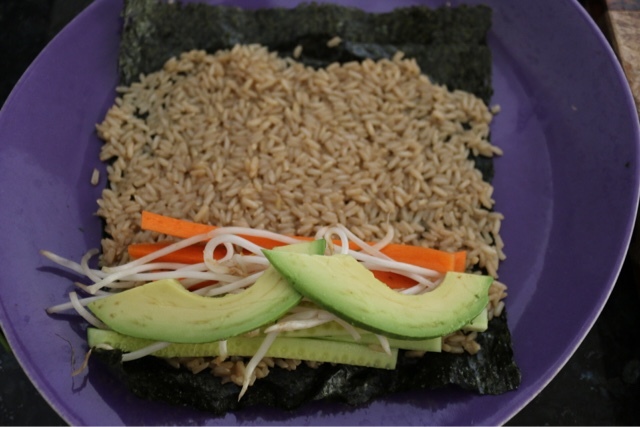 You can use a sushi roller but you really don't need to because the warmth from the rice will moisten the Nori Paper making it easy to roll. Using a very sharp serrated knife cut the roll into pieces. Yum! You don't even need a dip with this roll because the ginger and Liquid Aminos give this roll an authentic Sushi Soy Sauce taste. 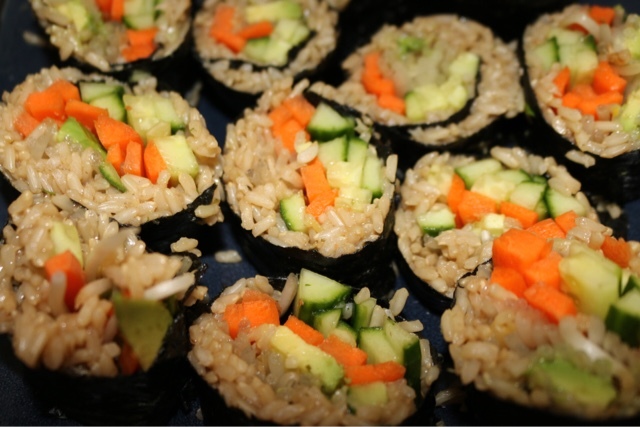 I like to pair this roll with a Smokey Cucumber Salad which I will post the recipe for shortly! This recipe is low fat, all natural, gluten free, gmo free, vegan and so delicious! Love your body! Eat fruit for Breakfast! The best way to start your day and love your body, is to eat fruit for breakfast! Your body has been sleeping and recovering from the day before. You awake renewed with an empty stomach and typically haven't eaten for a few hours. The first thing you put into your body should be something that revitalizes your systems. Fruit should be eaten alone without any fat or protein with it because it slows down the digestive process and how the sugars in fruit are broken down. When you eat fruit alone it digests super quickly and the body uses the sugars immediately! 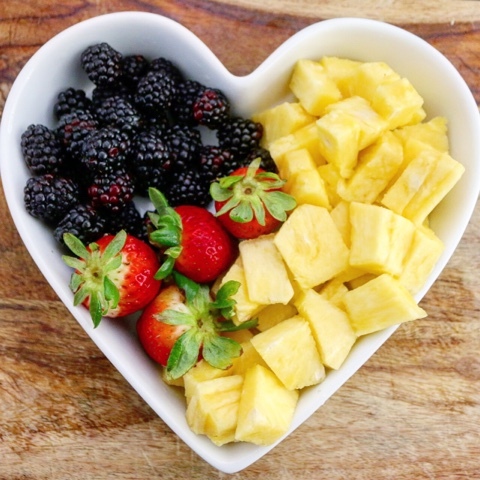 Show your body some love and feed it fruit first thing in the morning! Are you tired after you eat? Here's why! This breakfast is fast nutrition. Since the fat in Chia Seeds and Hemp Hearts isn't Saturated and essential for the body, it is metabolized quickly. The nutrition in dates is energizing and also used immediately by the body. When you eat whole foods that have no chemicals or by products your body is energized because it uses the food as fuel instead of using fuel and energy to break down the food and figure out what to do with the byproducts. You should never feel tired after you eat. You should be eating to feed the body to maintain health. When you feel tired after you eat, it means the body is working too hard to digest your food causing stress on the body instead of feeding it. Take note after you eat and ask yourself.... Am I feeding my body nutrition or feeding my mind what it's been taught to think is food? Blend ingredients in a food processor until it forms a log. 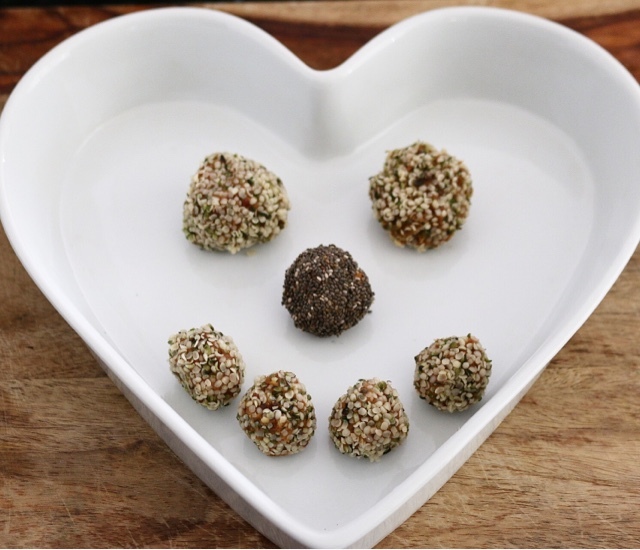 Form into balls and roll in Hemp Hearts. Blend all ingredients in a food processor. Take a chunk and drop it into the chia seeds then roll into a ball. Let the power of cold pressed juice change your life. If you add one cold pressed juice a day to your nutrition, you can get 100% of your daily required vitamins and toss that synthetic ultra processed multi vitamin away! 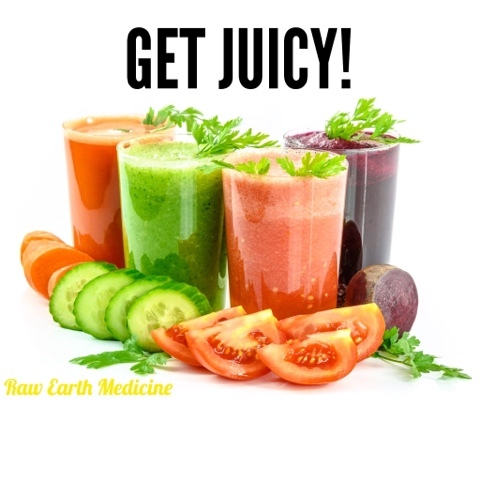 Cold-pressed juice is made with a hydraulic press that uses thousands of pounds of pressure to extract the maximum amount of liquid from fresh fruits and vegetables. No additional heat or oxygen is used in the process, meaning that no nutrients are lost in the heat of traditional pasteurization. You get all the nutrients and vitamins you need with immediate absorption without anything else being added, keeping the fruits and veggies Raw and full of nutritious goodness. There's also a juice recipe for almost every kind of ailment. All it takes is giving the juice 2 weeks of consistent consumption to show you results. Before reaching for that pill, reach for a glass of cold pressed juice and give your body the chance to heal itself!